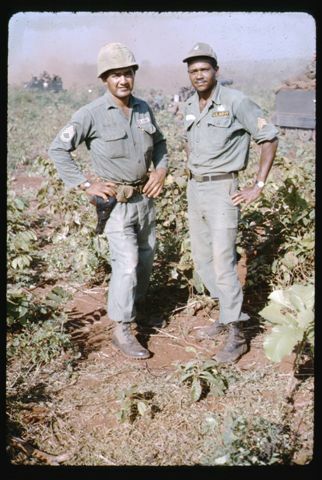 Jan , 1965 the 3/18 Attached to 23rd Artillery Group were issued ordered for Vietnam. 3/18 left Ship Oct 28. 1965 to dig in until 1st Cavalry came picked the Btn up to join 1st Cavalry HQ joining them Oct 29, 1965 An Khe Vietnam. November 26 to 27, 1965 A-Btry 3/18 Arty with 4 -8 " Howitzer and convoy were sent to Pleiku Vietnam to Build Artillery Hill # 54 on way to Pleiku through Mang Yang Pass A-Btry routed the Enemy from Plei-Me to Plaice and to Kontum putting North Vietnamese back into Cambodia other hot spots were Dak -To Mireles was still Chief of Firing Btry. Again Duty called Sgt. First Class Mireles returned to Vietnam 1967/68 was called Chief of Smoke on Artillery Hill # 54 under Captain Rex Weaver. Sgt. First Class Gregorio Mireles returned to Ft Lewis Washington where he retired in 1973. On August 24. 2000 Sgt. First Class passed away at Madigan Hospital from surgery of Coronary Heart Disease at age 69 year `s old. Sgt., First Class Mireles was one the greatest man to serve with 1964 and in Vietnam under 1st Cavalry 1965/66 as Chief of Firing Btry 3/18 Artillery. Sgt. First Class Gregorio Mireles was Cremated August 24, 2000 part his ashes in Texas and Puyallup Washington with his Wife Betty and one Son Tony and 3 Daughter `s at Oakwood Hill Funeral Chapel . Sgt. First Class Mireles was and Artilleryman all his entire Career. Sgt. First Class Gregorio Mireles was first Chief of Firing Btry to serve in Vietnam War since the Korean War. Duty, Honor, Family. SEXTON, CARLBORG, R. MILLER, TAKIO FUJII, DAMMIER, BERNIE VIPOND, TOM BROWN.